One of the great experiences of summer is to sit poolside enjoying the warmth of the sun. Maybe you’ll have a book in hand or your earbuds tucked into your ears as you listen to the latest summer jams. You love the sense of relaxation it brings especially when your entire pool area looks great. An awesome pool deck is a huge part of a pleasant experience. The first purpose of any deck is, of course, to provide space for walking without getting your feet dirty or leaves puddles of mud around your yard. It also helps keep the pool clean, since those same feet aren’t tracking that mud into the water. The deck is also a place to stroll and to sit – either on the lip of the pool or on furniture. So it’s a highly-functional surface. But there’s no reason it can’t look incredible, too. We don’t have to be content with something plain or even ugly just because it meets another need. A great-looking surface helps increase your enjoyment and relaxation. There are great options for pool decks that blend form and function – and stamped concrete is among the best. Stamped concrete offers a number of advantages as a choice material for around your swimming pool. Let’s have a look at a few of them. First, stamped concrete is durable. It is, after all, concrete. It’s not going to rot or wear out – at least not in your lifetime! Under normal circumstances, concrete is going to hold up for decades or longer. So with regular maintenance, you’ll be able to enjoy your deck for the entire time you own the home. So what is involved in regular maintenance? Not a whole lot, really. Caring for this material is simple. You can sweep it off, power wash it, and even use a mild detergent if necessary. It might not even be right to call it “maintenance” – it’s more like cleaning. The only real maintenance, then, would come about every two years. It consists of having the concrete resealed. Resealing helps preserve the integrity of the surface as well as its color and design. This isn’t expensive or time-consuming. If you’re really good at DIY products and have experience with sealing concrete, you might be able to do it yourself. Normally, it’s best to let your contractor do it though to make sure you preserve the appearance. Stamped concrete is also versatile. By that, I mean that you can have a huge variety of designs to suit the style of your home and yard as well as your own tastes. It’s hardly the plain old look of grey slab concrete. You can choose to have it done to look like cobblestone, brick, pavers, or hewn stone. You might even choose a wood plank appearance. Then you can pretend your on the deck of a schooner sailing the high seas! That brings us to safety. With many of the other types of deck you could choose, you have to worry about pieces that work loose, presenting tripping hazards. You could stub your toe. If you elected wood, you might end up with splinters in your bare feet. And metal? You could have burnt toes! But stamped concrete presents a single sheet of concrete. It does have texture to it for the sake of appearance, but the entire surface stays intact. There are no pieces that need to be reset. It also stays cooler than most other materials, helping you to keep you comfortable as you walk about. For additional safety, special sealant is used around pools to provide more traction. Of course, there are a couple cautions to be mindful of. One is taking care with chlorine. Under normal circumstances, this isn’t a problem. At the same time, it is a corrosive chemical and if a large amount of chlorine accumulates in one spot, it can wear through the sealant and damage the concrete underneath. So be sure to clean up any chemical spills and avoid areas where pool water is constantly going to drip. Hosing down the deck occasionally also is a huge help. Opinions are divided about saltwater pools. Our own experience shows that there aren’t normally problems – just observe the same cautions as with chlorine pools. Simple care goes a long way to protecting your investment. Finally – the price. You’ll probably be shocked to find out that stamped concrete is reasonably priced and is competitive with the lowest-priced surfaces and beats many of the most-popular ones. What Exactly Is Stamped Concrete? 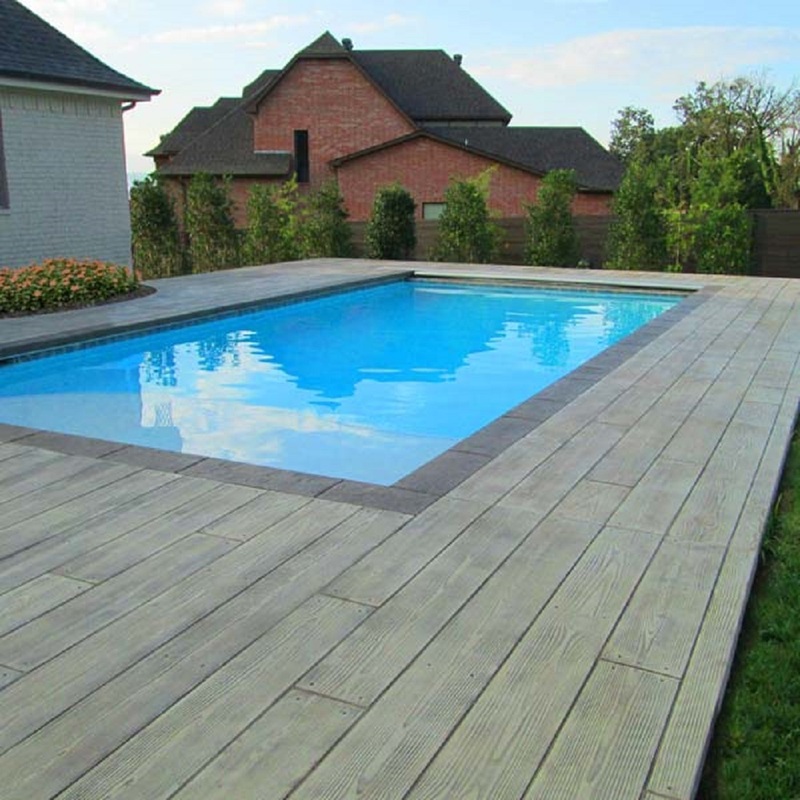 I’ve talked about why stamped concrete makes a great option for your swimming pool deck, but you might be wondering exactly what the material consists of. In reality, the name says it all. Stamped concrete is regular concrete that is colored and stamped to produce a pattern. As we’ve said above, there are many different patterns available that imitate the appearance of brick, stone, and even wood. New patterns are constantly being developed as well. Concrete is mixed as usually. Some contractors use a dye during the mixing process, although our own experience is that it works better when “cast” on the surface once the concrete is poured. This provides a more consistent, longer-lasting color. As the concrete begins to dry, metal or urethane stamps are used to create the pattern. That pattern includes the stones as well as the joints between them. Secondary colors are added to highlight these joints. In that sense, stamping concrete is really simple to do. There are definitely not a lot of steps to it. What makes it difficult is understanding how concrete dries and knowing the right time and pressure to use with the stamps. Obviously, any client wants a realistic surface, and that means that it has texture and depth to it. Pressing the steps into the drying concrete requires careful balance to achieve that depth – without leaving uneven spots or footprints! When you really want a great pool deck that looks great and enhances your enjoyment, stamped concrete is a perfect choice. Its beauty and durability make it a fantastic option. It will serve you well and add to the beauty of your yard and entire property! Bill Michaels works for Patterned Concrete as a media outreach specialist. The company is an expert and pioneer in stamped concrete since 1972. It has grown from its Toronto-area roots to have franchises across North America. If you’re a concrete mason and interested in stamped concrete work, get in touch for info on how to become a part of the family!